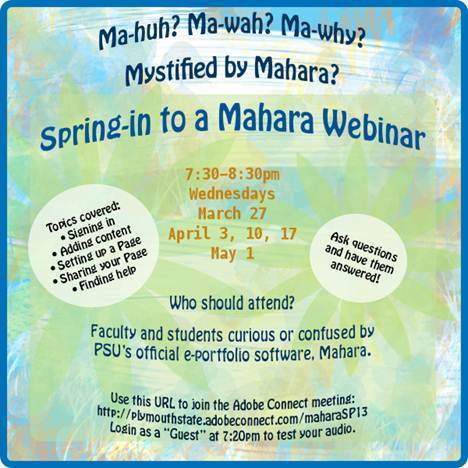 LTOE Webinars: Get LIVE Mahara Help! Click link below to join the Adobe Connect meeting. Login as a "Guest" around 7:20pm to test your audio. Many institutions are implementing Google Apps for administrative reasons (to provide email to students, for example). Google Apps, though, has many facets and the resources can also be used as a pedagogical tool for teaching and learning. Through this workshop, attendees will gain a better understanding of the Google Apps for Higher Education and how they can be utilized inside and outside of the classroom. Attendees will also see through specific examples how faculty at North Shore Community College use Google Apps with their students. Andrea Milligan will present an overview of the Google Apps for Higher Education. She will also discuss the various uses and benefits of each tool in the teaching and learning environment. Larry Davis will discuss how he uses Google Documents, Google Sites, and Blogger in his onsite and online courses. His presentation will use examples from student projects to highlight the pedagogical benefits of using each tool. Lance Eaton will explore Google Forms both as a means of surveying students and soliciting feedback throughout the semester and developing rubrics for either instructor or peer feedback. And he will also highlight some of the benefits and uses of using Google Documents to organize course and student work. LTOE is sponsoring this event, and will be streamed in Lamson 217. The recording of this event will be posted here when it is available. Watch the recorded event HERE! LTOE is happy to sponsor a NERCOMP Virtual Workshop on Introduction to Blended Learning on October 9 from 1-2pm in Lamson 102. Come expecting to learn about the types of blended learning, tools of the trade, and different ways to design blended courses. Barbara Schwartz from Lesley University will be leading the webinar. This will also be a good opportunity to check out what a webinar is all about! On Wednesday, September 12 at 2:00 p.m., we invite you to participate in an exciting webinar entitled, Advancing Pedagogy with Clickers in Higher Education presented by Elizabeth Scheyder of the University of Pennsylvania. As clickers become more and more commonplace in higher education, anyone can use them to poll their class on multiple-choice questions or to simply take attendance. But instructors can go beyond and use these devices for more advanced purposes. This presentation will explore the creative and innovative ways in which clickers have been used to advance pedagogy at an Ivy League university, and will provide specific examples instructors can use in their own classes. Elizabeth Scheyder is a Senior Instructional Technology Specialist in the School of Arts & Sciences at the University of Pennsylvania, where she supervises a wide variety of projects assisting professors who want to improve their classes with instructional technologies. EdCamp Seacoast is an unconference. What Does That Mean? Come enjoy a day with colleagues from the tri-state area and beyond. Arrive with an idea for a session that you would like to lead or with the anticipation of a full day of learning. A session might explore a technology tool, a discussion about best practices, or a collaborative presentation with multiple facilitators. During the first hour, you will have time to meet other teachers over coffee. There will be an empty session board where you and all attendees can post session titles. Over the course of the day, you will have the opportunity to attend up to four sessions. Edcamps empower attendees with the rule to “vote with your feet”. If a session doesn’t meet your needs, simply get up and move on to another room. We will be providing a certificate of attendance for the professional development you receive. You will learn something new, maybe make a new friend, and receive information that you can immediately apply in your classroom and professional life! EdCamp Seacoast is free. Lunch will be provided by local sponsors. Bring a friend. A laptop with wireless Internet is useful. It will allow you to view the session board online, take notes, and view websites discussed throughout the day. Visit our website http://edcamp.wikispaces.com/edcamp+Seacoast and reserve your space. Registration is limited. Launching September 26th, this open course will provide both theoretical concepts and practical tools for instructors to recognize, organize, and build courses for both blended learners and online learners. You will learn from 11 instructors and instructional designers including distinguished Exemplary Course Program (ECP) Directors and several of the 2012 ECP winners. Using the Blackboard Exemplary Course Program (ECP) Rubric as a guide, the course will focus on the four critical elements of a course: design, interaction and collaboration, assessment, and learner support. The course will run from September 26th - October 17th, 2012. Replay of webinar is HERE! Online learning is proving to be equal if not superior to the traditional classroom setting when measured in terms of faculty perception, student satisfaction, and evidence-based achievement of desired learning outcomes. In this webinar led by Brenda Watkins and Celeste Fenton of Hillsborough Community College, you will “pack your backpack” with practical strategies to improve student motivation and engagement in your distance learning courses. Administrators of online courses and programs will discover ways to measure effectiveness to determine alignment with program goals and comparability to program courses delivered via other modes as well as professional development models that facilitate stellar online teaching. This session will serve as an introduction or refresher for instructors new to teaching online, or as a means to encourage fresh thinking for experienced online faculty or administrators charged with evaluating online course/program rigor and effectiveness. About the McGraw-Hill Learning Institute: The mission of the McGraw-Hill Learning Institute is to foster institutional excellence by bringing together faculty and academic thought leaders to explore and encourage new approaches to teaching and learning. The third annual THATCamp New England will be held at Brown University in Providence, RI, on Friday, October 19, and Saturday, October 20. THATCamp ("The Humanities and Technology Camp") is an unconference around the topic of how technology is influencing teaching, research, and service among humanists at universities and colleges. THATCamp New England 2012 is being hosted by Brown University with the generous support and sponsorship of NERCOMP. The conference will have two parts. First, the conference will have a day of workshops, all day Friday. These hands-on, instructor-led sessions will introduce participants to the basic skills, tools, and concepts of the digital humanities, with no prior experience required or assumed. We are planning short workshops on text encoding, database concepts and visualization, among others.Second, on Saturday there will be a number of "unconference" sessions. Participants will propose session topics on the conference website in advance. On the morning of the conference, participants will vote on the topics to create the schedule for the rest of the day. Participants will then organize discussions or work together on various technologies, rather than reading and responding to papers. THATCamp is a conference that welcomes graduate students, faculty, educational technologists, librarians, museum professionals and anyone else who is working or wants to work in the humanities and with technology. --You use emerging technologies to rethink what "the humanities" is all about. --You use technology in a way that disregards traditional boundaries between disciplines and hierarchies --I'm sure others will have different and additional perspectives, but that's what springs to my mind first. 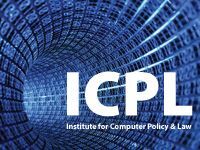 The Cornell University Institute for Computer Policy and Law (ICPL)—the "go-to" conference for information technology policy and law in higher education—will broaden its reach in 2012 in order to address rapidly evolving legal, policy, and social concerns related to Internet culture and the Academy. The following is the list of keynote speaker presentations. Click the link below the event description to attend LIVE. Wednesday, September 19 - 1:30 p.m.
"The Humanities in and for the Digital Age"
The spread of digital technologies has presented scholars in the humanities with some extraordinary opportunities, as well as a few challenges, not least for their modes of communicating with one another. This talk will explore some of the changes taking place in the humanities today and their implications for scholars and their institutions. How will our ways of thinking about scholarly communication change as we do more and more of our work on digital platforms? Thursday, September 20 - 10:30 p.m.
"Online Teaching and Learning: A Revolution in the Making"
Pick up any newspaper these days, and you're bound to find a reference to some university's plans for online learning and teaching. We have seen such plans fizzle in the past—so what (if anything) is different this time? We will discuss recent studies carried out by Ithaka S+R and review new initiatives in the private sector. With powerful analytical evidence that learning outcomes are the same online as in the classroom, what are the implications, financial and otherwise, for universities and colleges? Thursday, September 20 - 1:30 p.m.
Facebook and other online networks make money by selling ad space to companies that want to reach us—and the magnitude of information such companies have about each of us is stunning. Andrews will discuss the implications of data aggregation and the myriad ways in which we can be affected by assumptions made by aggregators based on our web behaviors. Thursday, September 20 - 7:30 p.m.
"Net Smart: How to Thrive Online—Essential Literacies for the Always-On Era"
The future of digital culture depends on how well we learn to use the media that have infiltrated, amplified, distracted, enriched, and complicated our lives. Elaborating on his recent book, Net Smart, Rheingold will discuss the essential literacies for the always-on era: attention, participation, collaboration, crap detection, and network know-how. Friday, September 21 - 8:30 a.m.
"Disciplined Inquiry in a Digital Age"
Educational philosopher and cognitive psychologist Jerome Bruner writes, "The goal of education is disciplined understanding; that is the process as well." Hiding in that little word "disciplined" are normative assumptions about rigor, complexity, modes of inquiry and expression, and the distinctive value of formal education. Campbell believes the digital age compels us to look anew at the word "disciplined," in terms of both the way our intellectual work in the academy is organized (our "disciplines") and in the learning experiences we craft for our students. We will explore ways in which current paradigms constrain us and our students and how the Internet itself may offer new paradigms of "disciplined understanding." Professors occasionally get lampooned as luddites responsible for the famously slow pace of change in higher education. But in truth the majority of professors are excited about various technology-driven trends in higher education, including the growth of e-textbooks and digital library collections, the increased use of data monitoring as a way to track student performance along with their own, and the increasingly popular idea of “flipping the classroom.” However, other technology trends are more likely to make professors break into a clammy sweat. Those are among the findings of "Digital Faculty: Professors, Teaching and Technology, 2012," a study conducted by Inside Higher Ed and the Babson Survey Research Group. On Monday, September 24 at 2 p.m. EDT, Inside Higher Ed editor Scott Jaschik will discuss the findings with Joshua Kim, director of learning and technology, Master of Health Care Delivery Science program, Dartmouth College, and blogger at Inside Higher Ed; Steve Kolowich, technology reporter at Inside Higher Ed; and Jeff Seaman, co-director, Babson Survey Research Group.